The bold, delicate Danbury towel bar (view larger). Moen's Danbury collection offers a blend of bold and delicate, tapered and tiered, and it's a discreet complement to a variety of bath decors. Whether providing a place for a wet towel to dry or decorative towel to be displayed, this 18-inch towel bar lets you add functionality and beauty to your bath. It has a brushed nickel finish that brings the warm look of stainless to your bath. It's also available in oil rubbed bronze. 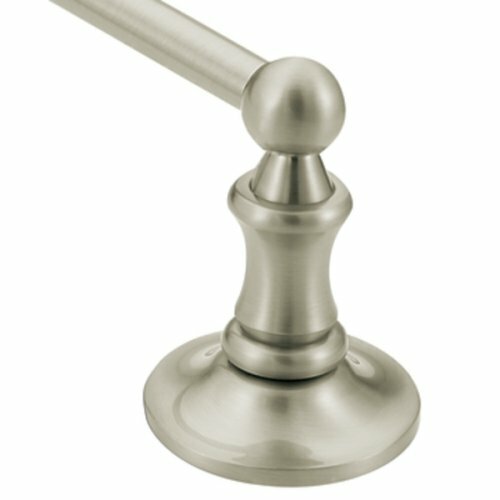 The included template and mounting hardware takes the guesswork out of installation, and the towel bar includes a metal mounting post for extra security. The towel bar is constructed of corrosion resistant brass, while the bar posts are made of zinc. View More In Bathroom Hardware.